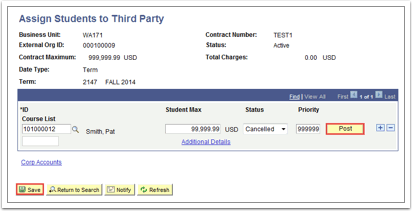 Purpose: Use this document as a reference for how to link and cancel a student from a third party contract in ctcLink. 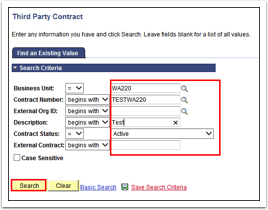 On the third party contracts page, enter Search Criteria for the contract then click Search. Enter the Student ID that you want to assign to this contract. Update the Student Max, if required. Enter the Student ID to cancel. Change the status from Active to Cancelled. A new Reverse Detail window will open. Enter the Reason for cancelling and click the OK button. 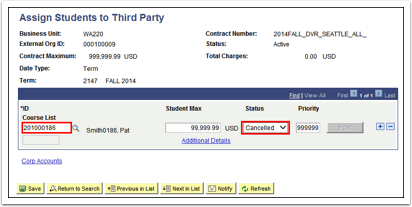 Click the Post button to cancel the student from the contract. 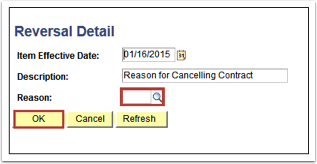 Review the external org account to ensure that the contract has been removed and the charges on the external org have been adjusted. Click the Corp Accounts link. 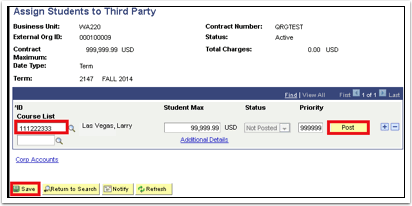 Click the Third Party Contract link to display all of the contracts to which the external organization is linked. The page displays details about the third party contract. To download the information into Excel, click the icon. Review the TPC account balance on the Corporate Accounts page.